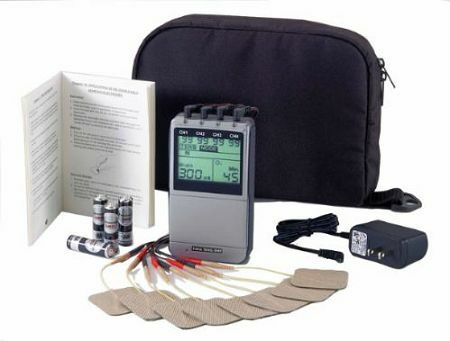 The Twin Stim Plus 2nd Edition is a high quality 4 channel, TENS & EMS Combo device that can be used with 8 electrode pads. Users can now select from 4 different modes and operate the device through 4 individual channels with 8 electrodes. You can use this device for TENS or EMS stimulation applications. With a stronger than ever processor, this device gives physicians and patients the capability of having a "Clinical" style device in a portable version. I am paralyzed from the waist down and I use this to maintain muscle mass, particularly in the buttocks. It stimulates circulation as I use two one hour daily. My legs look normal and healthy after 15 years. With rechargeable batteries they are portable and very easy to use. I highly recommend them. This is the second unit I ordered for my use and my wife. We have one for TENS and EMS for my wife and one for EMS for me. Easier than going to the gym for me and it enables my wife to exercise without taxing her MS symptoms but maintaining muscle tone. Great device, easy to use. Just received the tens machine-used it last night for sciatic pain in my leg caused by tight pirformis muscle. Not as strong as the one at the chiropractic office but for the money works well to calm tense muscles. This unit is EXCELLENT and very versatile, I like that we can use all 4 channel out of this unit, which you can cover a larger area. Battery or plug in wall is great. My wife and I use it very often and has help us very much. 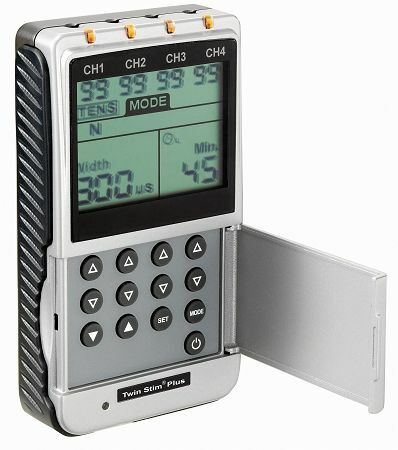 This tens unit is great.it's a very convenient tool. Excellent unit. Love that it plugs in to the wall. Carrying case cheaply made, arrived broken but no big deal. The electrodes the unit comes with are awful... very sticky and oily, leaves messy residue on anything they touch. Luckily I purchased extra packs of the "premium" electrodes, which are perfect. Similar in feel to the ones used at my doctors office. Very happy with the unit combined with the premium electrodes. My only wish is that the unit would save the region intensity settings; every time you turn the unit on, you're pushing "up" on the intensity for each region to get where you need it to be. I like to have mine in the 30s to 50s so I'm pressing "up" 30-50 times on each region... every time I turn it on... hope the unit is built for that kind of button abuse over time. Very happy with it despite the carrying case, the electrodes it comes with, and the button pressing. Wouldn't hesitate to recommend it. I like the product a lot. It works very well especially since there are 8 electric pads. I love the caring case and the quality of the product. Also the pads do not wear out as other brands that I have used. The only down fall is when turning up the stimulate frequency you always have to start at zero so if you want to get to 90 you have to push the button 90 times and since there are 4 you have to do this 4 times. Overall the product is a can't miss. Excelent product, I bought for my back and my legs and I've had very good results. My husband is trying to prevent his th back surgery and his Pain Management MD along with his PT suggested a Tens unit which is no longer covered my insurance . He loves this unit and feels it has made a big difference in his pain level and mobility.. We give it a five star. Quality machine, user friendly. Very pleased with this purchase. I bought this for my son and daughter in law due to the fact both of them were having muscle issues. They have been using this and had very good results in relieving pain and getting better function of their muscles. I would recommend this to anyone who have ongoing issues since it does bring relief. I was impressed with how well the unit works. It has many settings to work with. It is a solid, durable, handy piece of equipment. I hurt so badly, I could have cried. It took a few attempts to find a pleasant setting, but how sweet it is. It could take the pain away for hours. This is the second unit I’ve purchased from TensPros. I like the ability to treat both cervical and lumbar spine at the same time. The unit is constructed with better quality materials and uses AA batteries, preferable to 9 volt. Even better on sale! Great little machine. This is the third one I've had over the years. I use this for my lower back. Works great. Highly recommend this tens unit. Shipping was fast. Amazing. I use it all my body and I can control different cycle, time, and place. I had pinch nerves in my back along with bursitis in my hips and back issues .to make a .long story short this this device has made my muscle and pain less. I was skeptic . This device has helped me feel better and makes it easier to do my stretches and strengthen building.my muscles back Spode to injury’s. Well pleased.